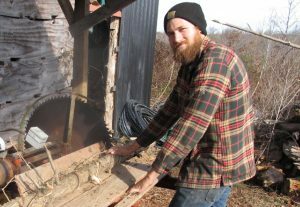 Alexis Zeigler describes Living Earth Farm, a conservationist-oriented community in rural Virginia where a DC microgrid provides reliable energy, fossil-fuel free. It’s been a windy spring in the Mid-Atlantic. Our neighbors have lost power several times, including a multi-day outage that caused vexation and set the generators abuzz. I live in a community that was designed to operate without fossil fuel. Our community did not lose power, and hasn’t in the last eight years since it was built in a rural area of Virginia. 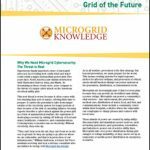 We have our own microgrid. The annual battery degradation cost for the battery system for our microgrid is about $25 dollars per year — for the whole system, not per-capita. Our system is very different from anything else we have seen. We can take a hot shower any time, day or night, 365 days a year. In winter, our buildings stay warm, heated almost entirely with solar warmth, pumped and stored using high-voltage DC blowers. We grow most of our own food. 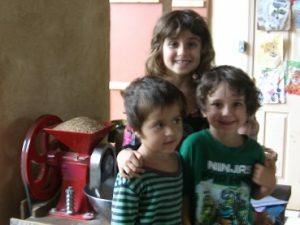 We grind all of our own grain using a high voltage DC grinder, and cook our food without fossil fuel. I can surf the net all night if I want, or watch movies anytime, including when our neighbors have no power. I can drink a refrigerated glass of lemonade (you can have the beer if you want) any time I want. We use high voltage DC powered equipment to dry and process products from our farm, which is how we earn our living. 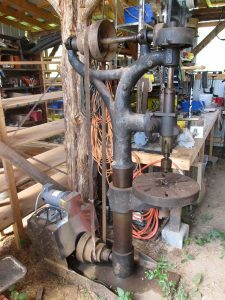 We run a fully tooled shop, complete with a respectable array of woodworking and metal working tools that we use to make and repair equipment for our farm and for the continuing development of our own independent DC microgrid. We have batteries connected to DC LED lights for night time lighting. Our battery set is about one-tenth the size of what you would expect to see in a single off-grid home. Our lights never dim, even when we go for weeks on end with heavy clouds. We use nickel-iron batteries. We have one that is about 100 years old, and it still works. No joke. The design principles of our community are simple. It is a community supporting several families, and various visitors who stay for days or months on end. We have an integrated village-level energy system, and community-oriented buildings. Our buildings are well insulated. Strawbale buildings cost no more to build than conventional buildings, but they have three to four times as much insulation. And a lot of the work can be done by unskilled work parties, barnraising style. That helps keep it cheap. A conservationist-oriented, village level design allows us to provide a high level of service with dramatically less energy. We can support all of our residential needs, and earn our living, using about 200 watts per person. With our system, one electricity source can support dozens of motors. AC power moves long distances down a wire, but AC systems tolerate precious little voltage variation. Under-power an AC motor, and you cook it. Inverters have to have near perfect voltage input to manifest their immaculate output. AC systems must have redundancy built in. They have to be over-sized to make sure their immaculate output is maintained. This need for immaculate power, combined with high battery costs, are the reason conventional off-gridders are near extinction. Grid-tie solar electricity is the new moral painkiller on the market, but it leaves users fully dependent on energy derived from coal, nuclear, and frack gas. DC electrical systems are the opposite in many ways of AC. High voltage DC can travel a few hundred feet down a wire, but not hundreds of miles. Industrial DC motors tolerate wide voltage swings without a problem. In our community, most (87 percent to be exact) of our electricity is used directly from photovoltaic (PV) panels to run DC motors. Sun comes up, motors run. Sun goes down, motors stop. We have a reverse redundancy design. We can overload the system. It’s fine. The motors speed up and slow down as power supply fluctuates. Electronic circuit salesmen need not apply for employment here. Sunshine regulates our circuits. We have dozens of high voltage DC motors doing all kinds of useful work. Our fridge is daylight drive, our space and water heating systems are as well. We use irrigation water for air-conditioning, also daylight drive. We have a reverse redundancy design. We can overload the system. It’s fine. We use various methods to store energy in non-electric forms. A high-tech thermal medium under the house called dirt stores heat in winter. We have larger-than-average water storage tanks so we don’t have to run a water pump at night. It’s not free, but it’s much cheaper than storing electricity. We have solar hot water tanks, daylight drive powered. I can take a hot shower if it was sunny four days ago. We use some firewood to cover the gaps in space heating and water heating, but having made those gaps narrow, the wood to fill them is very modest. Our systems are working great, and now we are trying to export them. That will happen over time, but it would save a lot misery, and more than a lot of carbon, if we could export them more quickly. Conspiracy theorist like to talk about suppressed technologies. Mostly, that’s bunk, but technology does not move uniformly forward. It moves toward profit. Ask any machinist who works on older, but far more durable, engines and they can explain it to you. One simple example is that the efficiency of the average refrigerator in the U.S. declined from the 1940s to the 1970s. With centralized grids, the bulk of the capital investment is at the production end and consumers pay in small increments. The combination of cheap, bulk energy and the market economy in its current form encourages waste. Our community microgrid is the opposite. Our system is flexible and multi-linear. Overload one part of the system, and it will weaken slowly, giving users time and motivation to amend their ways. Our microgrid encourages conservation by design. AC grids and other modern microgrids do not. Epistemology is the study of knowledge, the science of the evolution of science. A classic in this field is The Structure of Scientific Revolutions, by Thomas Kuhn. In retrospect, we tend to think of the fundamental shifts in science and technology as organic, the natural product of our growing enlightenment. Kuhn painted a different picture. From Galileo to Newton to Einstein (with a lot of minor characters in between), each scientific revolution is bitterly resisted by the defenders of the intellectual status quo. “History is written by the victors” applies to science as well as politics. We have been trying to encourage the expansion of our DC microgrid. But it begs some fundamental questions. In learning about microgrids around the world, they are all, so far as I can tell, based on the bulk power model set in place by the centralized boiler economy based on high-voltage AC power. But a photovoltaic panel is not a boiler, and it’s a terrible waste to treat it like one. Boiler based grids and their modern derivatives are capital intensive. Yet another advantage of our DC microgrid is that you can stack it up like building blocks. A little here, a little more there. Build what you can afford now, and add services later. Our DC microgrid is designed to provide services, not bulk energy. DC motors run on DC power, and that’s the stuff that comes out of PV panels. If it sounds too simple, it is. Microgrids for the poor and downtrodden in Haiti? That means acres of PV panels, computerized controllers, wires down the muddy street, computerized meters on the hovels? (That’s not theory, that’s what is being built.) Liquified natural gas to provide electricity in Puerto Rico? But don’t they have a lot of sunshine? Plenty enough for DC microgrids, but not for AC grids, micro or not. Thomas Kuhn is dead. The struggle to bring about energy enlightenment is not. It is painful to watch the centralized energy systems being built to (supposedly) provide energy for the world’s poor. They never actually work, not on any scale, and not for long. If you can’t afford the steak dinner, you have to go hungry. That’s sad. There is a better way. We encourage you to learn about it. Read additional Industry Perspectives articles here. Very nice Alexis and thank you for the education. Thank you for the encouraging information. We would love to try what you are doing on our Virginia homestead.